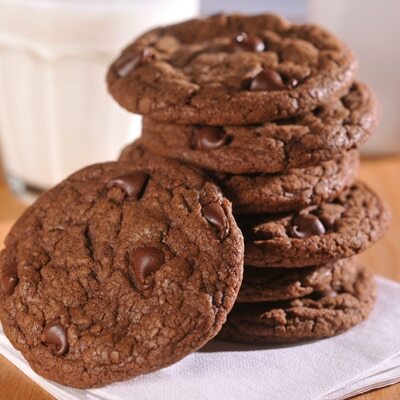 Ultimate Chocolate Chocolate Chip Cookies are an amazing and chocolatey treat. Easy to make and so very delicious. MELT 2 cups morsels in small, heavy-duty saucepan over low heat; stir until smooth. Remove from heat. COMBINE flour, baking soda and salt in medium bowl. Beat butter, brown sugar, granulated sugar and vanilla extract in large mixer bowl. Add eggs, one at a time, beating well after each addition. Beat in melted chocolate. Gradually beat in flour mixture. Stir in remaining 2 cups morsels. Drop by rounded tablespoon onto ungreased baking sheets. BAKE for 8 to 9 minutes or until cookies are puffed. Cool on baking sheets for 2 minutes; remove to wire racks to cool completely.